Used-vehicle loan payments stayed relatively steady in 2018, mostly because of customers' cost restrictions and availability of older vehicles, according to Cox Automotive. While the average monthly payment last year rose 4 percent on new-vehicle loans and 5 percent on leases, the average used-vehicle loan payment increased just 2 percent from 2017 to $411, according to Cox. The slower growth rate in the average used-vehicle payment is largely because of demand for affordable vehicles and a strict budget among used-vehicle buyers, said Jonathan Smoke, Cox's chief economist. Average monthly lease payments rose to $487, Smoke said, because of residual values working against leases. Average monthly new-vehicle loan payments climbed to $547, as the types of vehicles financed shifted to larger, more expensive models. Smoke said last month in Detroit that for many used-vehicle buyers, a $400 monthly payment can strain their budgets. Vehicle costs are rising, but consumers still need affordable transportation, he said. To stick within their budgets, many are buying older, high-mileage cars over trucks and SUVs. 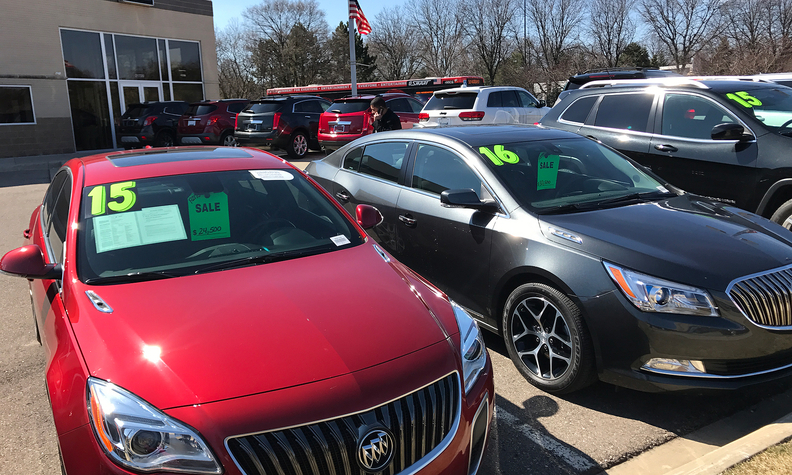 The mix of off-lease and off-fleet vehicles allowed for a wide range of prices among used vehicles last year, Smoke said. "The used-vehicle market is amazing. It's got a car for every price point," he said. Compact car market share has shrunk to 30.4 percent of new-car sales, though it represents half of Manheim auction's sales. Car demand in the used-vehicle market is so strong that many of the most popular compact and midsize used cars are worth more today than a year ago, Smoke said. For example, according to Manheim data, a midsize 2016 Toyota Camry and a compact 2016 Toyota Corolla were worth more on Jan. 2, 2019, than they were a year earlier, even though they had an average of 12,000 additional miles on them.